What the heck is the “Synopsis Scripturae Sacrae” of ps.Athanasius?? Enthusiasts for the authenticity of the “Three Heavenly Witnesses” passage in 1 John 5:7 are well aware that no Greek manuscript contains it. But as I remarked in a previous post, they point to a work by Athanasius, the Synposis Scripturae Sacrae (“Summary of the Holy Scriptures”) as evidence that it was part of the text in his day. But what on earth is this work? And how has it reached us, and what scholarship has been done upon it? Let’s look at how we got this text, and then we can talk about what it contains. The work is listed in the Clavis Patrum Graecorum under CPG 2249. It has reached us in a single manuscript, which remained unknown until 1895, hidden in the prestigious surroundings of Eton College, where it has the shelfmark Codex Etonensis 144 (formerly B. l. 5. 13). J. Armitage Robinson published it in that year in Texts and Studies 3, “Euthaliana”, p.106-120, with a collation of the manuscript against the PG text. The manuscript was written by Ducas the Notary, among others, at the end of the 14th or start of the 15th century. Other manuscripts seem to exist. The Pinakes database gives a list, which contains four manuscripts that look like full-length texts: Tübingen Mb 10 (16th c.), Vienna theol. gr. 249 (16th c.) and two 18th century Greek manuscripts – but I am not aware of any publication that deals with them. 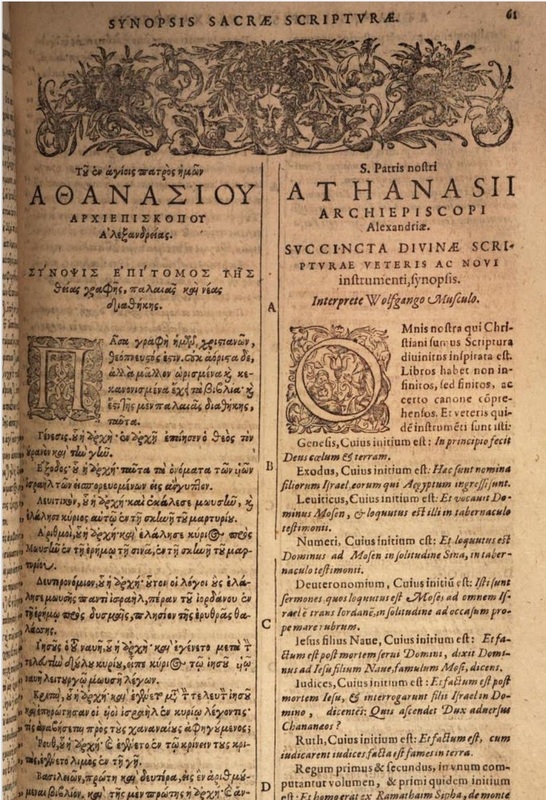 Synopsis Scripturae Sacrae in Felkmann’s edition of Athanasius (1600). The text was edited again by Montfaucon, and reprinted by J.-P. Migne in the Patrologia Graeca vol. 28, cols. 281-438. There is no critical edition of the text, and the only translation is that of Musculus into Latin. The opening section of the work has been translated into English by Michael D. Marlowe and placed online here. Studies of the work have been few. The only serious study, until a decade ago, was undertaken by Theodor Zahn in Geschichte des neutestamentlichen Kanons, 1890, Band 2, Hälfte 1, p.302-318. Zahn established that the work is not an original literary composition. Rather it is a collection of materials about the books of the bible and their contents, assembled from pre-existing sources in a pretty raw manner. The work contradicts itself; at one time it describes the Old Testament apocrypha as useful for reading; at another it states that they are not to be read. No work of this title is attributed to Athanasius in any ancient or medieval source. We have detailed lists of his work in Jerome (de viris illustribus 87) and Photius (codd. 32, 139, 140). It is not found with any other work of Athanasius in the manuscript. It contradicts what Athanasius says about the canon in his 39th Festal Letter, and ignores the Shepherd of Hermas, so dear to Athanasius’ heart. The Synopsis takes material from the genuine Festal Letter 39. A section on the translation of the Old Testament is taken word-for-word from Epiphanius. Another section belongs to the strange book of Josephus Christianus. The content for Leviticus, Paralip., Esra, Prov., Job, Esther, Judith, Tobit, Sapientia Sal. is almost literally identical with corresponding sections of the Synopsis Scripturae Sacrae of ps.Chrysostom, another confused text of the same genre, which appears to be older than the ps.Athanasius. We cannot give be more precise on the period when the Athanasian Synopsis was written. For the time being there is nothing to be found in the relation to Josephus Christianus; for 1) the original affiliation with the parallel section on synopsis is highly doubtful, 2) that Josephus, whose work is nothing more than a compilation of very different books, may as well have drawn this passage from our synopsis, but conversely, 3) the time of Josephus is a very unknown or at least uncertain thing. The dependence of our synopsis on that of Chrysostom, on the 39th festal letter of Athanasius, on a fifth-century Palestinian canon, and probably also on Epiphanius, places us in a monastery or church library in which these diverse spirits were united as equally venerable authorities. The compilation certainly did not come into existence before the sixth century, perhaps even later. Zahn wrote more than a century ago, and nobody has ventured to touch the work since. The only subsequent work is by Gilles Dorival in 2005, but this I have not seen and know only from a review. Work has been done on the related ps.Chrysostom Synopsis. But that’s another story. The text is related in some way to the Euthalian materials which appear in the margins and between books in medieval Greek bible manuscripts. So we are dealing with a mass of non-literary material about the bible, changed by every hand that touched it, incarnate in a variety of versions, and attributed to a variety of authors, none of them genuine. It’s really very like the Vitae Prophetarum Fabulosa that we encountered in ps.Dorotheus. 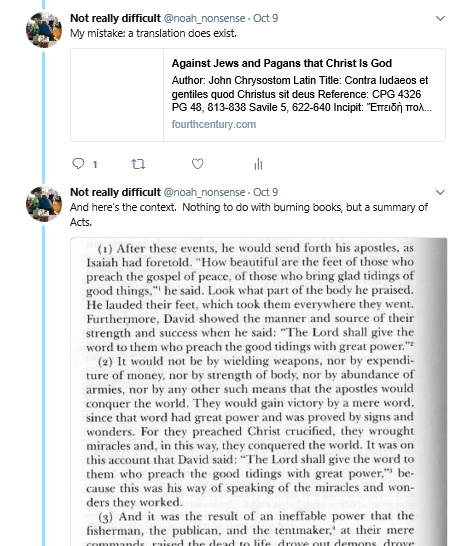 Posted in From my diaryTagged 1 John 5:7, Athanasius, Chrysostom, Synopsis Scripturae Sacrae12 Comments on What the heck is the “Synopsis Scripturae Sacrae” of ps.Athanasius?? 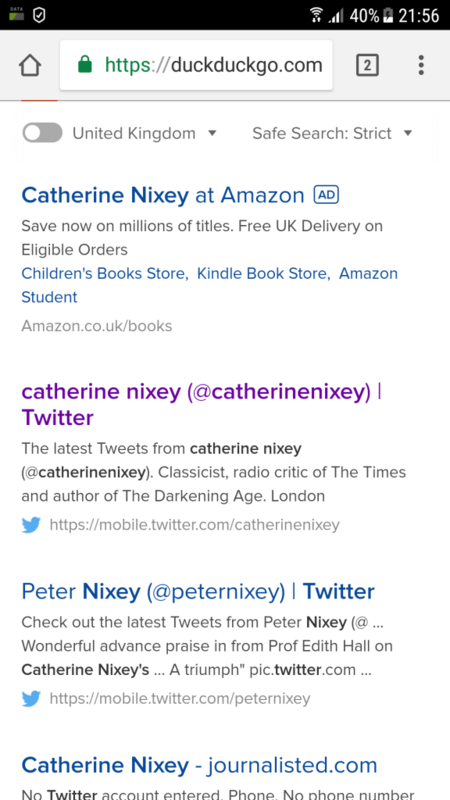 I learn from the Twitter feed of the excellent and erudite Pieter Bullens of a curious story. One of the most important manuscripts of Chrysostom’s Homilies on Matthew, currently University Library, Basle, under the shelf-mark B. II. 25, is to be sold at Sothebys after a 38-year loan. The Sotheby’s catalogue contains a number of images, and some truly fascinating details. The most recent edition of this work is F. Field, Sancti patris nostri Joannis Chrysotomi Archiepiscopi Constantinopolitani Homiliae in Matthaeum, 3 vols., 1839. (The Patrologia Graeca text being a reprint of the 17th century edition). But this manuscript was unknown to Field, being published only in 1900. What makes it special is a connection with the Latin translations of Chrysostom – in various passages it gives the same reading as Anianas of Celeda in the 5th century, where the majority of manuscripts are in error. It would be nice to think that the university library in Basle have made a digital copy of the whole manuscript before it went to Sothebys. It might be optimistic, too. Sales of collections are always sad. Sales of manuscripts often indicate the presence of death taxes, and other signs of the rapacity of the modern taxman. It is probably the German state that is responsible for throwing this item to the mercy of the art market, but I don’t know this for fact. As I don’t know how long this information will remain online, let me give a copy of the details here. I wonder who wrote it? It is magnificent! (1) Palaeographical analysis by Ernst Gamillscheg and Michel Aubineau suggests that this manuscript was written in the late 9th century in Constantinople; the close relationship with manuscripts written by Nikolaus Studites, notably a codex signed by Nikolaos Studites in 835 (St Petersburg, National Library, MS 219; see S. Lake, VI: Manuscripts in Moscow and Leningrad, 1936, no.234) and another manuscript attributed to Studites (Vatican Library, MS gr.2079; see E. Follieri, Codices graeci Bibliothecae Vaticanae …, 1969, pl.13 and B.L. Fonkitch, ‘Notes paléographiques …’, Thesaurismata, 16, 1979, pp.154-56) may indicate an origin in the Studiu-Monastery. (2) The first and two last leaves replaced in the late 13th century by an accomplished scribe. (3) Liturgical rubrics added by a 14th-century scribe (e.g. ff. 8v, 36r, 54r) indicate that the manuscript was kept at the Hodegon Monastery in Constantinople; another example is the Codex Ebnerianus (Oxford, Bodleian Library, MS Auct. T. inf. 1.10) that mentions the copyist and annotator Joasaph for the Hodegon Monastery in 1391 (see I. Hutter, Corpus der byzantinischen Miniaturhandschriften, I: Oxford, Bodleian Library, 1977, no.39 and E. Gamillscheg and D. Harlfinger, Repertorium aus Bibliotheken Grossbritanniens, 1981, no.208). (4) In England by 1900 (binding). Offered by Quaritch in their Catalogue No. 271: A Catalogue of Rare and Valuable Books, 1909, no.604; Catalogue No. 290: A Catalogue of Bibles, Liturgies, Church History and Theology, 1910, no.354; and probably also in subsequent catalogues; sold on 30 June 1914 to Karl W. Hiersemann, Leipzig, for £190 (BL, Add.64227: Quaritch, Account Ledgers 1913 onwards, p.174). (5) Bogislav Freiherr von Selchow (1877-1943), lyricist, naval officer and commander of Free Corps Marburg; his coat of arms inside the upper cover. (6) Martin Wahn (1883-1970), vicar and member of the Church Council of the Confessing Church in Kamienna Góra, Silesia, until 1947; died in Singen, southern Germany, just north of the German-Swiss border, in 1970. He may have received the manuscript through Bogislav’s sister Anni von Gottberg who was a member of the Confessing Church, Potsdam, and opponent of National Socialism. By descent to Martin Wahn’s grandson and then on deposit at the University Library, Basel, 1980-2018, under the shelf-mark B. II. 25. The manuscript includes the first 44 homilies of John Chrysostom on the Gospel of Matthew. The most recent critical edition of the text is F. Field, Sancti patris nostri Joannis Chrysotomi Archiepiscopi Constantinopolitani Homiliae in Matthaeum, 3 vols., 1839. (Migne’s Patrologia Graeca edition of 1862 simply reprinted Montfaucon’s older edition of 1612). None of these editions took into account the present manuscript because it was unknown to them. It contains numerous instances where its text sides with the Latin translation of Annianus (5th century AD Alexandria) over against the other medieval Greek manuscripts of John Chrysostom, e.g. folio 54 line 34 (Homily 8, vol. 1 p.102 Field) the MS reads parresias (which is correct and adopted by Field) over against periousias as given by MSS A, B, and the Armenian version – so that it can be seen that this MS represents an older tradition. 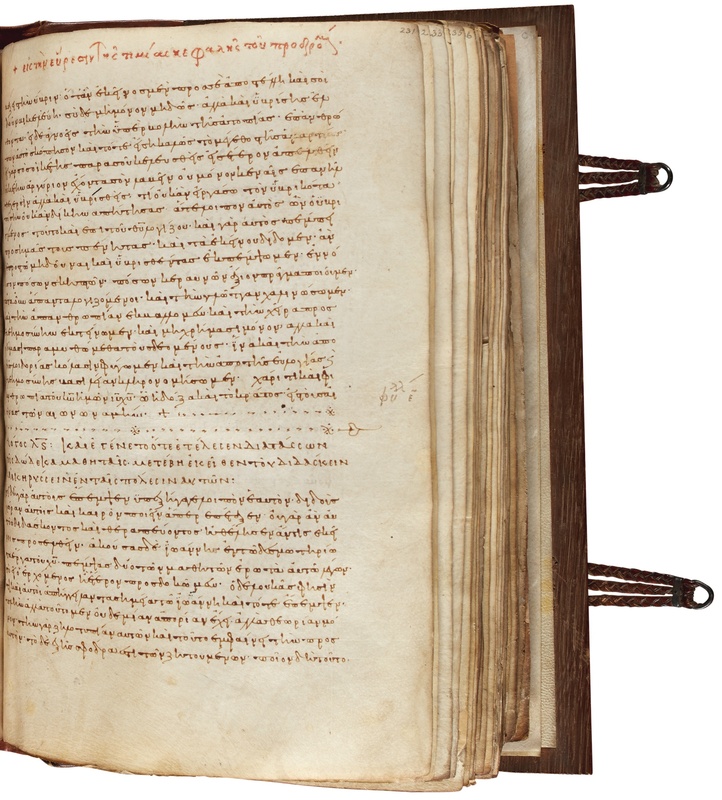 The manuscript contains extensive quotations (pointed out by diplai [>] in the left margin) from the Greek text of the Gospel of Matthew and other Old and especially New Testament texts. It is worth mention that the 9th-century scribe writes incipits of individual homilies and sometimes quotations from the text of Matthew in older-looking majuscules rather than the 9th-century minuscules for the text of John Chrysostom. There are frequent marginal ANNOTATIONS, some in early hands (if not identical with the original scribe’s), some later (including the hand of the 14th-century rubricator) which provide exegetical glosses, notation of variants from collation with other manuscripts, corrections of copying errors, and addition of scribal omissions (including the missed out text appended by means of the tipped in binding strip before folio 230). Insertions of missed out texts are regularly signalled in the margin preceded by an insertion sign in form of a modern division sign. E. Gamillscheg and M. Aubineau, ‘Eine Unbekannte Chrysostomos-Handschrift (Basel Universitätsbibliothek, B. II. 25)’, Codices Manuscripti. Zeitschrift für Handschriftenkunde, 7, 1981, pp.101-08. P. Andrist, ‘Structure and History of the Biblical Manuscripts Used by Erasmus for His 1516 Edition’, in Basel 1516. Erasmus’ Edition of the New Testament, 2016, p.85 note 14. Readers will understand if I admit that a purely temporary shortage of funds here at Pearse Towers means that regrettably I cannot save this item for us all. Those truly interested in doing so had better have wallets with more than $250,000 inside them. Petty cash to the well-connected, of course, but not a sum that most of us will dispose of. Whoever buys the item is likely to be a gentleman and a scholar, as well as a rich man. Let us hope that he will place the item online. Regular correspondent IG has written to say that her translation of the Laus Diodori by Chrysostom (PG 52: 761-766 = CPG 4406) is now available online on Academia.edu here. It’s just the bare translation, no commentary yet; but it’s there and it’s hot! Sometime correspondent “Inepti Graeculi” has been working away on some of the untranslated works of Chrysostom, and also some of the mass of literature attributed to him in transmission. This sort of work is excellent. Voicu has estimated that there are around 1,500 texts which are spuriously attributed to Chrysostom. 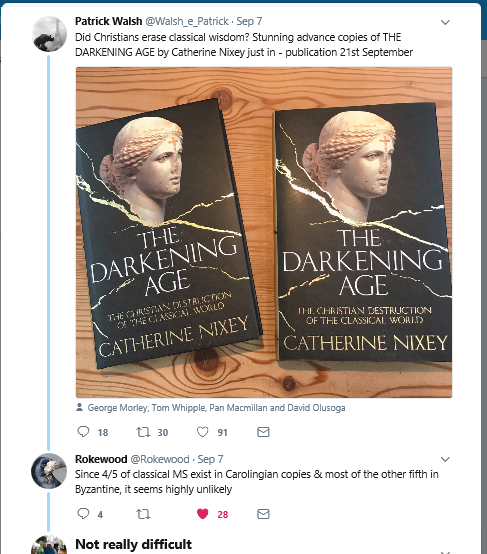 They are, of course, works which lost their original author, but were considered sufficiently interesting to be preserved; which means that they deserve attention now. These translations should do much to make that happen! Ps.Chrysostom’s In Parabolam Ficu (CPG 4588) – a popular work that argues against the notion that God rejected the Jews (versions found in Syriac, Ethiopic, translated five times into Arabic (! ), also in a very important manuscript in Slavonic etc etc. Wrongly ascribed to Severian of Gabala in the Armenian tradition. Voicu assigns this to an anonymous Cappadocian. The amazing Sever Voicu’s short outline of Chrystostom in the Oriental tradition is quite eye-opening. Here are the recent releases! Jesus: ‘If someone strikes you, turn the other cheek’. – something lost in translation there. 32. But since our discourse has now turned to the subject of blasphemy, I desire to ask one favor of you all, in return for this my address, and speaking with you; which is, that you will correct on my behalf the blasphemers of this city. And should you hear any one in the public thoroughfare, or in the midst of the forum, blaspheming God; go up to him and rebuke him; and should it be necessary to inflict blows, spare not to do so. Smite him on the face; strike his mouth; sanctify thy hand with the blow, and if any should accuse thee, and drag thee to the place of justice, follow them thither; and when the judge on the bench calls thee to account, say boldly that the man blasphemed the King of angels! For if it be necessary to punish those who blaspheme an earthly king, much more so those who insult God. It is a common crime, a public injury; and it is lawful for every one who is willing, to bring forward an accusation. Let the Jews and Greeks learn, that the Christians are the saviours of the city; that they are its guardians, its patrons, and its teachers. Let the dissolute and the perverse also learn this; that they must fear the servants of God too; that if at any time they are inclined to utter such a thing, they may look round every way at each other, and tremble even at their own shadows, anxious lest perchance a Christian, having heard what they said, should spring upon them and sharply chastise them. When I first read this, without considering the context, it looked like the utmost expression of arrogance, of the attitude of those in power. But this is to ignore the circumstances. In 387 the emperor Theodosius imposed an extraordinary tax on the city of Antioch, and the enraged citizens rioted and threw down the statues of the emperor. The emperor then threatened to destroy the city, and negotiations took place between the emperors representatives and the townsfolk. Paganism was still the official religion of the empire. But it seems that pagans and Jews were taking advantage of the crisis to jeer at the Christians of the city, and perhaps even at the religion of the emperor. This in turn couldn’t help the negotiations, when the survival of the city is at stake. This is a reaction to a threat to everyone, not a gratuitous attack on unbelievers. The citizens are appealing to the feelings of a Christian emperor – and, he reflects, these people are screwing it up! Slap them in the face if they won’t pipe down. It’s politics, in other words, and John Chrysostom speaks as the bishop of the city, almost in Byzantine terms as the ethnarch, rather than personally. But Christ did not give his teaching conditionally. Christians often feel a great deal of reluctance to endorse the actions of the church, post-Nicaea. This is one reason why. Here we have a popular preacher, and a gifted expositor of the bible, who, faced with a pagan reaction, incites his congregation not to turn the other cheek but instead to go out and do battle in the streets, for the benefit of the community as a whole. It’s understandable; but somehow we are not in the same world any more. A rather splendid Greek sermon appears in the Clavis Patrum Graecorum as entry 4622 (vol. 2, p.577-8), among the spuria of Chrysostom, with the title De salute animae (on the salvation of the soul). Some mss. attribute it to Chrysostom, others to Ephrem Syrus. It exists in two versions in Greek, and also in Coptic, Georgian and Arabic versions. The content of the sermon is terrific! It is an exhortation to Christians not to be led astray by the things of this world, but instead to strive to work out our salvation and to be what Christ wants us to be. The writer points out how futile the distractions will look on judgement day. Adam McCollum drew my attention to this obscure work, and he has kindly translated the two Greek versions for us. The translation is given in parallel columns, so that the differences can be seen. As is quickly apparent, this is one sermon that has been reworked by a secondary author. As with all my commissions, I place this in the public domain. Do whatever you like with it, personal, educational or commercial. 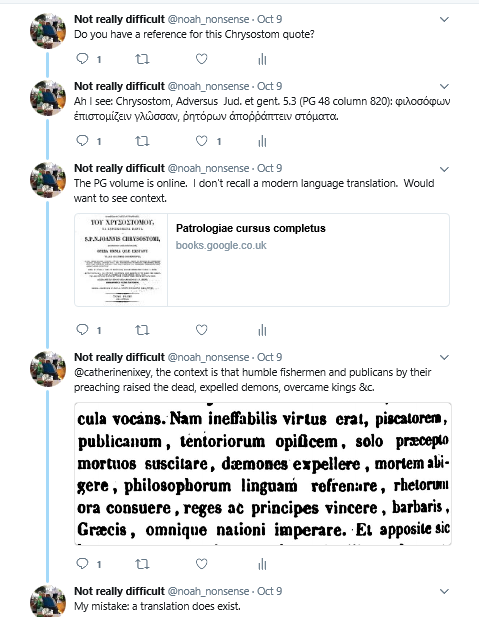 I’ve mentioned this before, but “Inepti Graeculi”, who occasionally comments here, has been working away at translating the letters of John Chrysostom and posting draft translations at Academia.edu here. An index of those letters translated is here. There are some 240 letters, nearly all from Chrysostom’s second exile, from which he did not return. Remarkably only a handful have ever been translated. So far IG has completed and posted drafts of 30 of the letters, which is more than have ever been done before. The project is attracting interest (naturally) from Chrysostom scholars. The project is nothing to do with me, but I deeply approve. This is the first time that I have seen academia.edu used in this way, as a way to get draft versions online for comment and to start a “virtuous circle” of involvement and interest. It seems to work well if used that way! I’ve spent today driving up to Cambridge to visit the university library. My object was to obtain some articles by R. Delmaire on the subject of Chrysostom’s letters. For the most part I was able to obtain these; although I was disappointed to discover that the latest available volume of one serial was not shelved or accessible. I’m reading into them at the moment. R. Delmaire’s 1991 study examined the letters, and reordered them by date. The order in the Benedictine edition (and the PG) isn’t even that of the manuscripts! 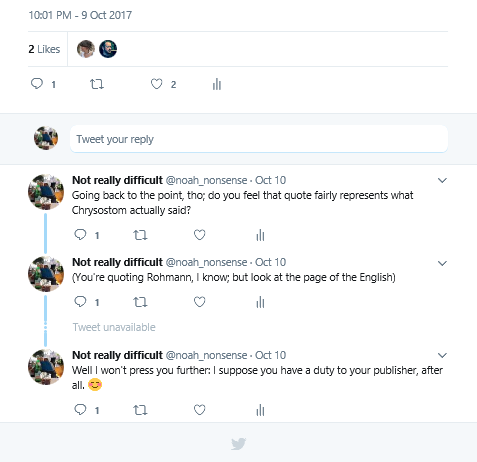 The Letters of Chrysostom project is not mine, so I won’t say a lot about this. But I have also discovered a list of the opening words of all of the letters at the Sources Chretiennes site here (PDF). Equally useful, I have discovered a list of the works of Chrysostom at the same site, with the Clavis Patrum Graecorum number for them all, here (PDF). I’ve also received from the Lebanese typist the next 10 pages of the transcription of al-Makin’s world history. This is taken from the 1625 Erpenius edition, which has the merit of being printed. Once we get to the end of this – for Erpenius died before he could complete editing the text – I shall have to try the typist on a PDF of a microfilm manuscript. An email has arrived today from the Bibliothèque Nationale Français, containing an estimate for reproductions of two manuscripts of al-Makin. They require 50 euros each, plus 10 euros for “shipping” (why?) plus M. Hollande’s tax on top of that, totalling around 130 euros, or nearly $190! Quite a bit for 2 PDF’s! Worse still, they propose to supply me with scans from microfilms — at least, I hope these are scans, for the estimate says only “microfilm”. And these will be black and white, and quite possibly unreadable. I have a lot of time for the BNF, but this is shameful. For that price they could at least photograph the things with a consumer digital camera and supply me with some decent images! I shall have to pay the blackmail – it is, at least, less than the Bodleian is demanding – but it is a salutary reminder, in these days of digitisation, how bad things were and still are in some places. I’ve just discovered a group of English translations available online here. All of them are of previously untranslated texts. Most excitingly (for me), the translator has started on Chrysostom’s letters. The translations are a work in progress; but very welcome!